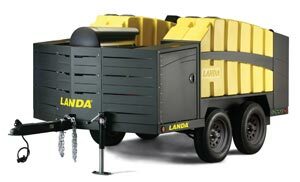 Landa’s revolutionary ECOS Mobile Wash/Reclaim System recovers, cleans and recycles the wash water from pressure washing for safe disposal or reuse—meeting most municipal and environmental regulations. And the fuel burner savings from the patented Trans-Heat Technology allows for a fast return on investment. 4.7 GPM at 3,500 PSI. Captures, filters, and recycles wash water for continuous use. Trans-Heat Technology for better fuel efficiency.